As the CPC’s 90th anniversary approaches, a recent “Red Song” campaign is receiving a lot of attention in the foreign media. Many of my colleagues from foreign news outlets have been looking for “Red Song choirs” to interview and to film. Some articles are even calling the campaign a “Red Revival” and see possible parallels to the Cultural Revolution. However, is that true? Does singing “Red Songs” really signify a new revival of the old Party spirit? Or is it something that has been happening all along but makes for easy headlines with Bo Xilai’s recent Chongqing campaign and the CPC anniversary just around the corner? Many ordinary Chinese of my parents’ generation wouldn’t think singing about the Party is anything new. 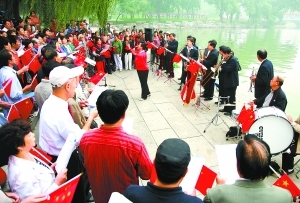 They learned those revolutionary songs as teenagers and young adults during the Cultural Revolution. They sang them every day during the most important, formative, and unforgettable decade of their life. These songs mean a lot to them. For many people, the songs are the only ones they know how to sing and for which can remember the lyrics. Once my husband and I were watching the documentary Morning Sun, which is about the Cultural Revolution. As soon as a revolutionary song started, my mom, who was cooking in the kitchen, started singing along. I have never heard her sing a pop song or love song. (When I asked her why, she said it was because she can’t remember any of those lyrics.) However, four decades after her miserable experience of heavy manual labor in a remote village during the Cultural Revolution, she can still remember every single word of those revolutionary songs. She couldn’t understand the English-language documentary, but the songs instantly brought her back to those days and her youth. My mom is not alone. Every summer night, a group of middle-age people spontaneously gather around in our local park to sing for entertainment. Of course, all the songs they pick are Red Songs. I don’t think they intentionally do so because of party spirit, it is just they know those songs really well. Sometimes it can be hard for me to understand their love of those songs. After all, many people suffered terribly during the Cultural Revolution. Many young people, like my aunties and my mom, were sent to poor and remote villages to be re-educated with heavy labor work for many years. Others couldn’t go to college because their parents were labeled as “bad elements.” Many families were ruptured when one family member accused another of being a counter-revolutionary. Some of those ruptures have never healed. For our post-80’s generation, those “red songs” are not unfamiliar either. I remember when I was in elementary school all the songs I learned were revolutionary songs. Plus, we had to sing those songs in our school’s singing competition every year. Even when I was in college, every cohort in every department still needed to prepare a “Red Song” for the university singing competition held each December. The first song I learned was “There is no new China without the Communist Party” (没有共产党，就没有新中国). It was a part of the school’s patriotic education. Unlike countries with multi-party governments, in China the Party makes sure you know that loving your country is equal to loving the CPC and loving the Chinese government. Thus many patriotic songs are about the CPC or about Mao. The big difference for our generation is that we also had Jay Chou. We also had Michael Jackson. We had all the pop stars from Japan and South Korea. We were “corrupted” by Western and Korean pop culture. For us, singing “Red songs” was a chore, something we did without any emotional attachment. Growing up in Chinese schools, the political significance of the songs was irrelevant to our lives and we never took them to heart. 60% of my college classmates had joined the CPC by the time we graduated, but very few of them believe in Communism. It is just something you do under the circumstances. For our generation, singing Red Songs is the same, just another political task for young people. No matter how glamorous, prosperous and international Beijing and Shanghai seem to be on the surface, some things never change. Most Chinese people, especially my parents’ generation, know that the party is everywhere. It is hidden under the surface, but it is never far away from any individual of this country. The Party leaves its mark in everyone’s life and “red songs” are just one of those marks.